On December 3, 2008, Janie McQueen had her twin babies, Sophia Susannah (Susu) and John Lathan (she has two older boys as well). Casting about for something to do from home when the babies were about 4 months, Janie and her mother Mary Patrick of Beaufort, S.C. (Janie’s hometown–she now lives in Atlanta) decided to start a company based on a generations-old baby bonnet pattern Mary still had. 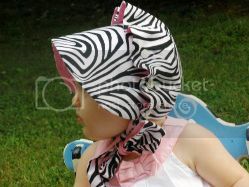 They named it the Beaufort Button Bonnet and updated it, keeping traditional ginghams but adding designer fabrics like Lilly Pulitzer-esque florals and a hot zebra stripe, and started selling online at SusuAndJohn.com and by word of mouth. The models, of course, came free. (Janie often used the affiliate marketing guide she won from Kim’s website for online sources, such as the HostGator account she credits for offering Site Studio, which helped her build the perfect site.) 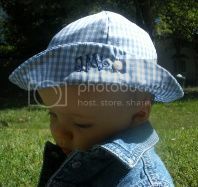 A boyish bucket hat with a buttons-all-around feature proved almost as popular as the bonnet. Soon they landed a premier manufacturer’s rep in the Southeast and went wholesale. The bonnets and hats they modeled in their backyard just six months ago (for a 10-year-old photographer, Janie’s son Thomas) are now being sold in upscale children’s boutiques and the finest gift stores. Customers include actress Blythe Danner, a longtime fan of Beaufort, where many Hollywood films are made. And the bonnets and hats are not only for Southerners–customers have ranged from Seattle to San Francisco to New York. Next up: coordinating diaper covers. To find Susu & John products, you can contact Janie and become a fan of their Facebook page. Also please urge your favorite boutique to carry them! Retailers in the Southeast can contact Larry Lucas Inc. Stores elsewhere can easily apply for a merchant account. For more information, please visit SusuAndJohn.com. A faithful WIMP reader, Janie thanks Kim for giving her some Internet savvy!